Stressed? With just a little practice, you can feel at 'om' almost anywhere, at any time. It’s common knowledge that today’s stressors are many. According to a report from the American Psychological Association (APA), American stress levels are rising for the first time in 10 years. Also common knowledge: chronic stress isn’t healthy — it contributes to a host of health issues, such as high blood pressure and heart disease. 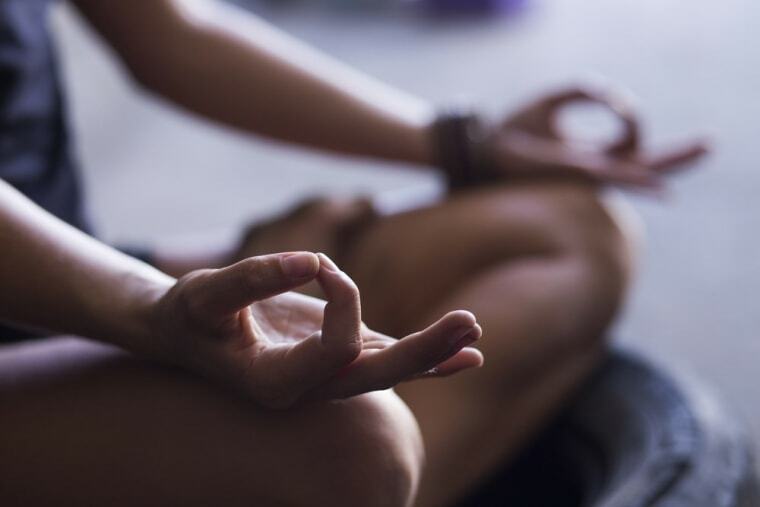 Numerous studies have found meditation may helpful in relieving anxiety and reducing stress — it possibly could even reduce risk of cardiovascular disease. But even with mounting evidence supporting its health benefits, the implied candle lighting, time and sacred space people think they need to begin a meditation practice can be a little off-putting. According to Light Watkins, meditation expert and author of "Bliss More: How to Succeed in Meditation," all you really need to meditate is a place to sit with some semblance of back support. “Real people living busy lives can meditate successfully on their seven-year-old couch, in bed alone or next to their snoring partner, in the passenger seat of their car, at work, at the kitchen table, in the backseat during a road trip, on a park bench, or in a bus or plane seat,” Watkins told NBC News BETTER. “And that’s as it should be, because if you are waiting to find yourself atop a cliff-side or in a white, sparsely furnished room in order to feel like you can meditate, you’re only going to meditate sporadically, and you’re going to mistakenly conclude that what little benefit you are able to derive from your practically is magically linked to your serene environment — which couldn’t be further from the truth,” he added. As it turns out, with just a little practice, you can relax almost anywhere, at any time. “It feels just as delicious to drop into a meditation when you are feeling blissed out on a pillow with soft lighting as it does sitting at your desk at 2 pm right as your morning coffee wears off,” says Emily Fletcher, founder of Ziva Meditation in New York City. Sophrology is the new stress-busting trend. What is it? So how can we access this delicious peace and quiet within, like, right now? Both Watkins and Fletcher shared a few mindful meditation hacks to get you started. The ability to meditate anywhere, at any time, just takes a little groundwork. Watkins recommends beginning your practice with just 15 to 20 minutes, first thing in the morning. “Sit relatively upright but your back does not have to be straight, and your shoulders don’t have to be drawn back. Likewise, your hands and feet should be at ease and you could even stretch your legs out in front of you, if you find that more comfortable,” says Watkins. “We’re going for supreme comfort and coziness here.” Set a timer and close your eyes. Don’t worry if you don’t instantly enter a state of blissful nirvana. Referring to a study mentioned in his book, Watkins says unwanted thoughts or distractions are part and parcel of the meditation process, and the key to meditating successfully is to remember that all thoughts matter — even those that seem random. His “E.A.S.Y.” technique reminds meditators not to try and control their meditations. The more consistently you meditate, the more mindful you’ll become, says Fletcher. “Do your meditations whenever and wherever you can fit them in. Ten minutes is better than zero minutes,” she says. Defined as a state of “heightened” or “complete awareness,” mindfulness is considered by Watkins to be a “byproduct” of meditation. So how can you tell if you’re actually meditating? In his book, Watkins defines meditation as allowing yourself the luxury to think about everything and nothing at the same time until reaching what he refers to as the “settled mind,” which is described as “random, unpredictable time lapses or gaps in between your thoughts, along with a slight-to-heavy feeling of forgetfulness,” similar to that fugue state you experience when you begin to drift off after reading in bed. Fletcher’s favorite mindfulness exercise, called Balancing Breath, or alternate nostril breathing, is a meditation warm-up that takes all of two minutes and can be done anywhere, anytime. “The relaxation potential of this breathing style is ideal to tap into between meetings, or on the way to meet your in-laws,” she says. “It helps to balance the right and left hemispheres of the brain and has immediate energizing and calming effects.” Don’t even have time for that? She recommends what she calls the “2X Breath” — breathe in for two counts through the nostrils and out through the mouth for four counts. “You would be surprised how rarely we take deep breaths, and it is a powerful tool to ground you in the present moment,” she says. Watkins defines meditation as allowing yourself the luxury to think about everything and nothing at the same time until reaching what he refers to as the “settled mind." One quick zen technique Fletcher uses, called “Come to Your Senses,” can easily be done on a subway, bus or anywhere. It simply involves closing your eyes and tuning into what each of your senses are experiencing in the here and now, one sense at a time.